UFOSeek Forum • View topic - 9/11 and no planes??? Post subject: Re: 9/11 and no planes??? OK. So I've decided to move on from the Twin Towers attack. It is a bit upsetting when you watch people's films of it. Apparently the government is being questioned over the pentagon attack. There are alot of people that want some answers. Well... I found something else, which you probably have seen. This isn't upsetting to view. Apparently, from what I've seen on the videos and people's stories that part of the pentagon was going to be refurbished and it was unoccupied. They think that is why it collapsed how it did. Now I went through heaps of footage and came across this. It appears to be filmed from a helicopter. Now this is a short film and goes for about 25 seconds. You'll see the crash at about 23 seconds. Right near the end of the clip. I paused it a few times whilst playing it so I could get a better view. Make of it as people wish. Doesn't look like a plane to me. Don't know if it is true footage or not.... but it makes you wonder. Really.... she's hyjacked my link to the video. Drat I'll get another link. Government people, they're everwhere aren't they?!?!? This feels like a de ja vu. Second attempt... hopefully you get to see it before it get's moved. Now THAT'S more like the hole I saw ... and THAT looks like a missile, to me! BTW, that section of the Pentagon had just finished being renovated; not all the offices were occupied, again yet, at the time of the tragedy--that's why more people weren't killed. I watched that several times, pausing it at the mark you said. "A lot of ah, uncertainty right now as to what is happening, you can see there are choppers--I believe that could be a police helicopter that is co...oooh." She only mentioned choppers being in the area after the drone came into frame. She was stunned and shocked when the tower exploded because what appeared on screen had no wings or propeller, which is the very reason she said it only might be a chopper. She used the smallest aircraft that most people would be familiar that fit closest in size to the unknown flying blob. She could have said it was a green concord, but its unknown status would remain for anyone dealing in reality. "We just saw another (long pause because she did not describe a plane) live picture of, duhhh, what I believe, duhhh, was a plane that just hit another plane?" So, it went from an unidentifiable chopper, to, duh, what she knew had to be a plane, because that's what was supposed to happen, but didn't. She first described it as what might be a police helicopter and after she realized it caused the explosion, changed her thoughts in that moment. These women literally got trapped in the twilight zone. If it wasn't a helicopter, (no propeller) it certainly could not have been a plane. She simply repeated what it was supposed to be, but the orb was shown at least six more times and was described as a plane or twin engine jet. The first computer generated image was first shown only one minute after the last orb. You can see the time change to 9:27. 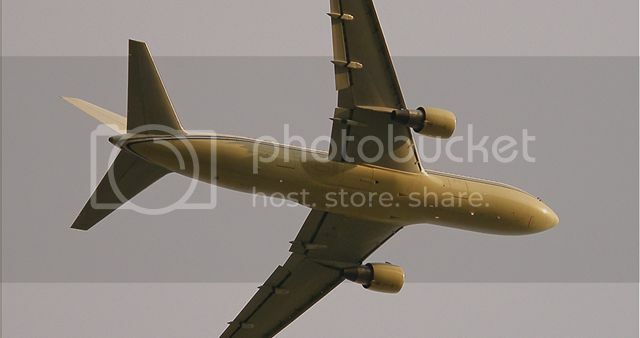 The fake image is so poor that it has no wings and two dots for engines. Notice the bogey move directly east and cgi more left/north. Whomever Cloud turned his footage over to added a black blob. Clifton, did not hear nor see a plane. It would have been coming from his left. Clifton, debunks all video fakery shown on 911. Advance to 2:00 for his real-time account. He says it over and over and over and over. He didn't see a plane because there was no plane to see. The blob cannot be seen south of where it magically appeared. He was about a mile east of the towers and slightly north. "I just caught the second explosion on videotape...No, a bomb, I saw it, no plane hit nothin', the building exploded from the other tower floors down." 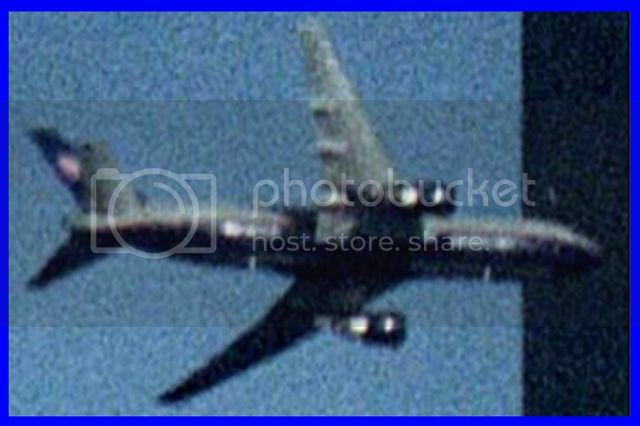 Using crap fuzzy very low quality heavily distorted badly compressed clips from youtube is not evidence of real boeings. Why don't the plane idiots source the originals and go buy themselves some copies and make a short video showing something different than blurry black blobs with wings and engines misplaced that all support cgi planes? Because they know that all plane photographs and videos are easily proven fakes. 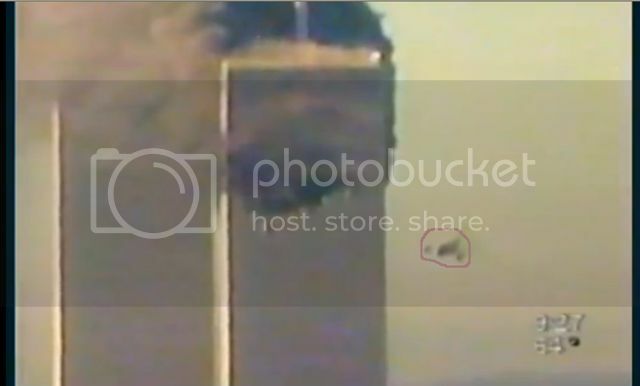 You have to admit if that happened and it showed real boeings, then honest thinking folks would have to rethink their conclusions that jackass fakery was used on 911. 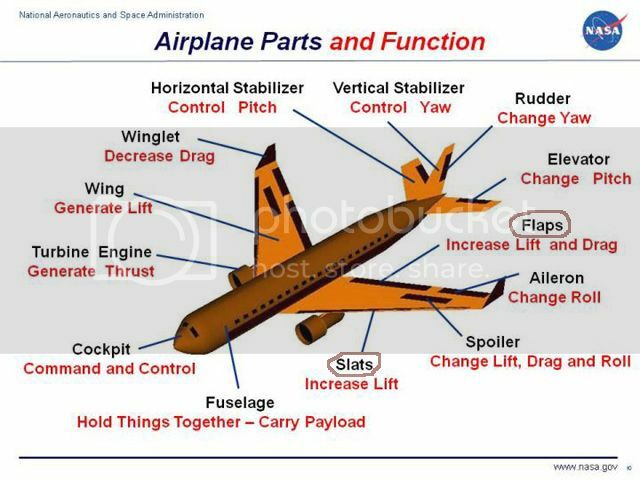 A real boeing banking left does not make the right engine appear closer to the fuselage, nor can the left wing be attached to air with the flap open on the front, instead of rear where it must be, but isn't, because it's a disasterous fake failure. The hinged control surfaces are used to steer and control the airplane. The flaps and ailerons are connected to the backside of the wings. The flaps slide back and down to increase the surface of the wing area. They also tilt down to increase the curve of the wing. The slats move out from the front of the wings to make the wing space larger. This helps to increase the lifting force of the wing at slower speeds like takeoff and landing. The ailerons are hinged on the wings and move downward to push the air down and make the wing tilt up. This moves the plane to the side and helps it turn during flight. After landing, the spoilers are used like air brakes to reduce any remaining lift and slow down the airplane.